Kick off your visit on the 6th (Tue): admire the natural beauty at Buckingham Palace, explore the world behind art at National Gallery, then take in panoramic vistas at Coca-Cola London Eye, and finally don't miss a visit to Big Ben. Keep things going the next day: pause for some serene contemplation at St. Paul's Cathedral, snap pictures at Tower Bridge, get a sense of history and politics at Houses of Parliament, then take in the spiritual surroundings of Westminster Abbey, and finally stroll through St. James's Park. For reviews, where to stay, maps, and tourist information, read our London trip itinerary website . Toronto, Canada to London is an approximately 10-hour flight. You can also do a combination of flight and train; or do a combination of flight, bus, and train. The time zone difference when traveling from Toronto to London is 5 hours. In August, London is slightly colder than Toronto - with highs of 26°C and lows of 15°C. 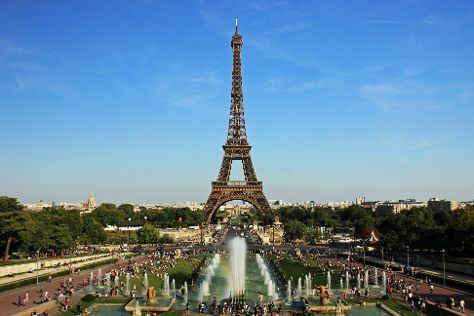 Wrap up your sightseeing on the 7th (Wed) early enough to take a train to Paris. On the 8th (Thu), admire the landmark architecture of Louvre Museum, contemplate the long history of Cathédrale Notre-Dame de Paris, and then take in the architecture and atmosphere at Sainte-Chapelle. Get ready for a full day of sightseeing on the next day: see the interesting displays at Musee d'Orsay, appreciate the history behind Arc de Triomphe, and then take in panoramic vistas at Eiffel Tower. To find other places to visit, ratings, maps, and more tourist information, you can read our Paris road trip planning site . You can take a train from London to Paris in 2.5 hours. Alternatively, you can fly; or do a combination of flight, bus, and train. You'll lose 1 hour traveling from London to Paris due to the time zone difference. In August, plan for daily highs up to 29°C, and evening lows to 16°C. Finish up your sightseeing early on the 9th (Fri) so you can travel to Rome. Rome is known for historic sites, museums, nightlife, shopping, and classes. Your plan includes some of its best attractions: contemplate the long history of Colosseum, pause for some serene contemplation at Santa Maria in Trastevere, admire the landmark architecture of Pantheon, and admire the masterpieces at Galleria Borghese. For ratings, more things to do, traveler tips, and other tourist information, use the Rome planner . You can do a combination of train, bus, and flight from Paris to Rome in 5.5 hours. Alternatively, you can fly; or drive. Traveling from Paris in August, things will get somewhat warmer in Rome: highs are around 38°C and lows about 24°C. Finish your sightseeing early on the 12th (Mon) so you can travel to Venice. 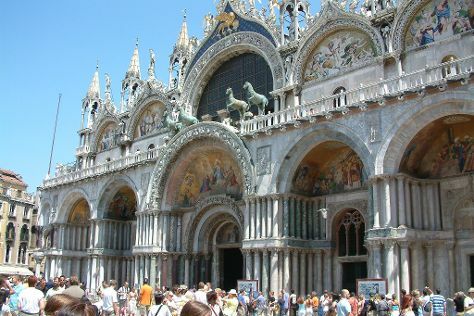 Start off your visit on the 13th (Tue): admire the landmark architecture of Doge's Palace, take in the views from Ponte dei Sospiri, take in panoramic vistas at St Mark's Campanile, then admire the striking features of Basilica di San Marco, then take a stroll through Campo del Ghetto, and finally explore the activities along Canal Grande. On the next day, pause for some serene contemplation at Santa Maria dei Miracoli, take in the views from Ponte di Rialto, then explore the world behind art at Peggy Guggenheim Collection, and finally get to know the fascinating history of St. Mark's Square. To find other places to visit, ratings, reviews, and more tourist information, refer to the Venice road trip website . Fly from Rome to Venice in 3.5 hours. Alternatively, you can take a train; or drive. Expect slightly colder weather when traveling from Rome in August: highs in Venice hover around 34°C, while lows dip to 22°C. Finish your sightseeing early on the 14th (Wed) so you can travel back home.